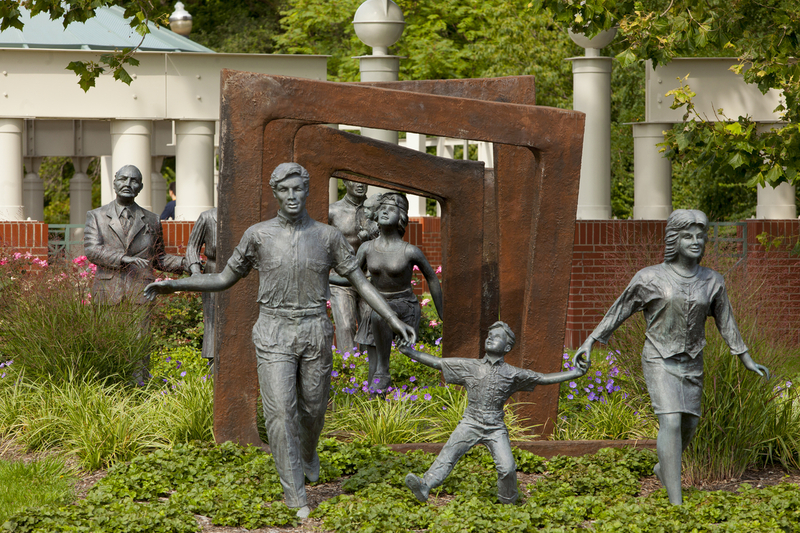 The Bloch Cancer Survivors' Plaza exemplifies one man's campaign to celebrate life while fighting cancer. It is the eighth survivors' park in the country, built thanks to a $1 million gift from Richard and Annette Bloch (Richard is the R in H&R Block Tax Preparation). In 1978, Bloch was diagnosed with terminal lung cancer. However, after a second opinion, multidisciplinary treatments of surgery and chemotherapy, and a lot of positive thinking, he attained full remission. The plaza was placed at the busy intersection of Lane Avenue and Olentangy River Road, where 70,000 cars pass daily, so that many people would become aware of its intent. Mr. Bloch personally selected the site over five others around Columbus. 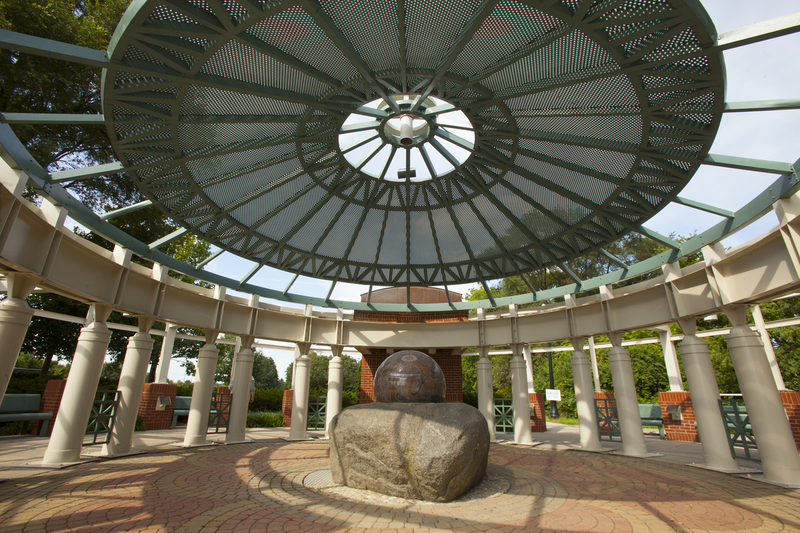 The park contains an "open arms" plaza, inspirational plaques, metaphysical sculptures, and natural features that combine to create a place of meditation and encouragement. One sculpture features eight life-size figures passing through a symbolic maze of doorways toward recovery. The positive mental attitude walk has 14 plaques – four with inspirational messages and 10 featuring instructive messages. A bronze sculpture, created by the late Victor Salmones, depicts the success of cancer patients who have overcome the disease. 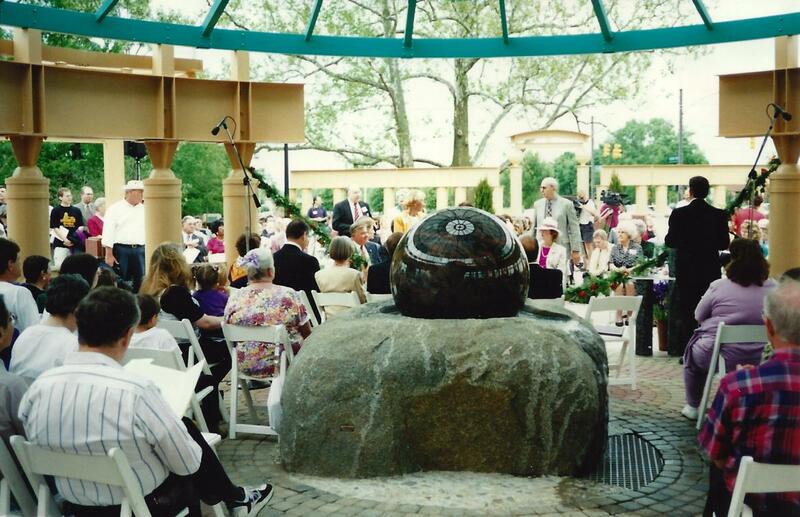 Another powerful sculpture component is the floating sphere fountain. 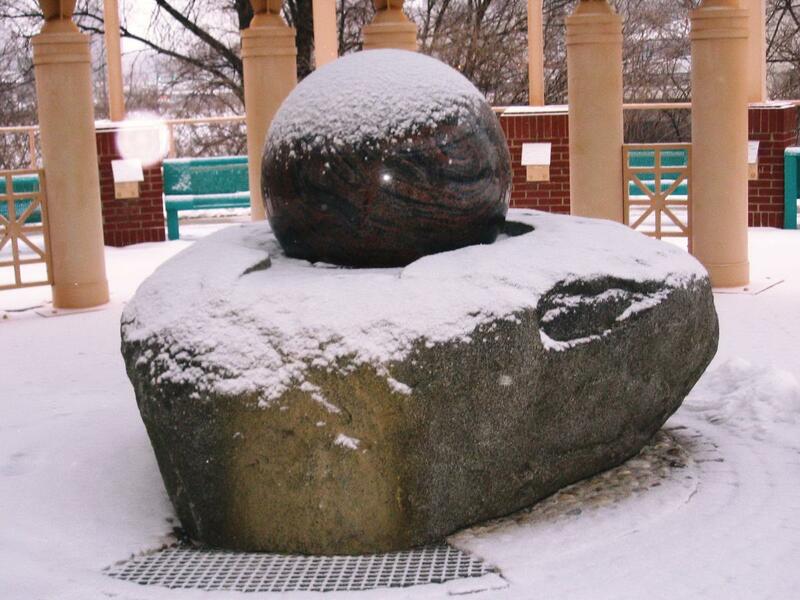 The smooth granite two-ton sphere, which is ground and polished, sits atop an eight-ton rough granite boulder receptacle that was brought from Germany. Water shoots up from underneath the sphere, fills the cup with water and, by hydrostatic pressure, the sphere floats. The area between the sphere and the socket that holds it is so tight that a credit card won't fit between them. By lightly touching the sphere, you can rotate it on its base. Milosav Cekic was selected to design this plaza and the other cancer survivor plazas around the world. He was present at the dedication, along with the Blochs; Mayor Greg Lashutka, Ohio's First Lady Janet Voinovich, OSU President E. Gordon Gee, Dean of the College of Agriculture Bobby Moser, Administrator and Director of Facilities, Operations, and Development (FOD) Jim Stevens, and OSU Chadwick Arboretum Development Officer Janet Oberliesen. The principal intent in the design of the plaza is to create an inspirational and beautiful place in a natural setting, and to infuse that place with strong metaphorical references reflecting notions of self-healing, inner light, and transformation. Local artists were involved in post-dedication design of the park to encourage community participation. The Bloch Cancer Survivors' Plaza in the Chadwick Arboretum & Learning Gardens provides a satellite reminder of the cutting-edge cancer research and innovative treatments that have become signatures of the world-renowned Ohio State University Comprehensive Cancer Center – Arthur G. James Cancer Hospital and Richard J. Solove Research Institute (OSUCCC-James).